Two explosions and gunfire were heard at an upscale hotel complex in Nairobi, Kenya's capital, on Tuesday afternoon, according to witnesses and police. The attack on the Dusit hotel complex - which also houses offices and banks - sent people fleeing for their lives, black smoke rising from the scene. "We are under attack," a person in an office inside the complex told the Reuters news agency. "It is terrible. What I have seen is terrible. I have seen a human as I ran out and there is what looks like minced meat all over," said one a man who said he ran from the scene. He did not elaborate further. "A group of unknown armed assailants attacked the Dusit Complex in what we suspect could be a terror attack," Kenya police chief, Joseph Boinnet, said. There could still be armed assailants in the building and the police operation was ongoing, he told reporters in a short briefing. "We are currently conducting an operation in Nairobi," the group's military operations spokesman, Abdiaziz Abu Mus'ab, told Al Jazeera. 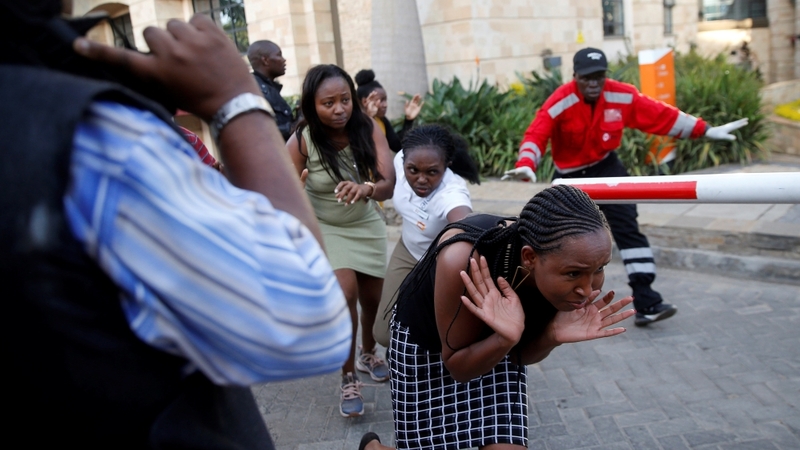 The attack came one day after trial began in another Nairobi attack al-Shabab claimed responsibility for: the deadly Westgate mall attack that left 67 people dead in 2013. Tuesday's attack is exactly three years after al-Shabab overran a Kenyan army base in Somalia, killing dozens of soldiers.